^These are posts from before I came to my current thesis problem (when my topic was misinformation). I won’t be including them in the thesis book. I’ve placed them here to help me keep track of my posts. ^These are posts from before I came to my current thesis problem(when my topic was misinformation). I won’t be including them in the thesis book. I’ve placed them here to help me keep track of my posts. explored the concept of facade as well as the initial exploration of stripping down the idea of food and eating. explored the idea of a ‘ceremony’ of eating and considering it being as, if not more important than the actual food. I didn’t explore interaction with others as much in this project, they’re not talking to people through the screen on their tray, but instead, the focus was on how the screen shaped the eating experience. The assumption is that they are interacting with the huge screen surrounding their walls to talk to others. I would want to explore interaction with others. I may take the project out of this future room I have created and in the present. People are aware of their habits of checking phones at tables and dinners. Will it help to have it happen surreptitiously? Black Mirror explores that by having screens placed directly into the eyes of the people. But what if it’s non-invasive. What if the screen is disguised as the fork. Another way to bring in interaction with others is through re-imagining the room. How will people be positioned in their rooms for ideal ‘viewing’ of the world? ^This is also an idea I would like to explore. The loss of agency people will have in this kind of world. The final design of the tray had places for the food and drink packets, a scent sensor at the bottom, a screen, cup and stirring rod. The nutrient and scent was in the buffalo wings, which when poured into the sensor would trigger aromas and a looping video of delicious looking wings on the screen. The Pina Colada drink had all the flavor and nutrients and pouring that into the water to drink it would complete the eating experience. Re-introduce idea of eating sludge-food, to emphasize nature of food in this world. no need for stirring rod? replace with spoon? Scent and flavour would be together. I reimagined the tray to continue having the screen, but with an actual ‘plate’ (a hollow torus that has been sliced from the top) that will contain the nutrient-rich sludge—providing the function of the noodles. ^3D software helped me get the shape and size of the tray and the torus just right, because it needed to fit snugly after printing. ^Going through the 3D printing process made me realise the composition was wrong and the drink should be on the left if the spoon is to be ‘set’ on the right. Next I had to redesign the packages. They were no longer simply dissolving, but needed to fulfill the function of getting scanned, to get the videos to play. ^experimenting with type and QR code layout. ^ The third packet was an experimentation with a different filling substance. At the end of it, I omitted QR codes, relying on research that explained there were now scanners that could simply scan logos of products to get the product details. (http://www.waspbarcode.com/buzz/future-barcodes/). ^I also created a set of 6 drinks. I made the food and drinks international cuisine, as the future will most likely be diverse. And although nutrients would be covered by food, having drinks was necessary for the facade of a meal. It was surprisingly difficult to find a good quality video of food from a top angle, despite Buzzfeed Tasty. The packaging will be attractive. Got inspired by different areas of pop culture and design, particularly ‘soylent’. 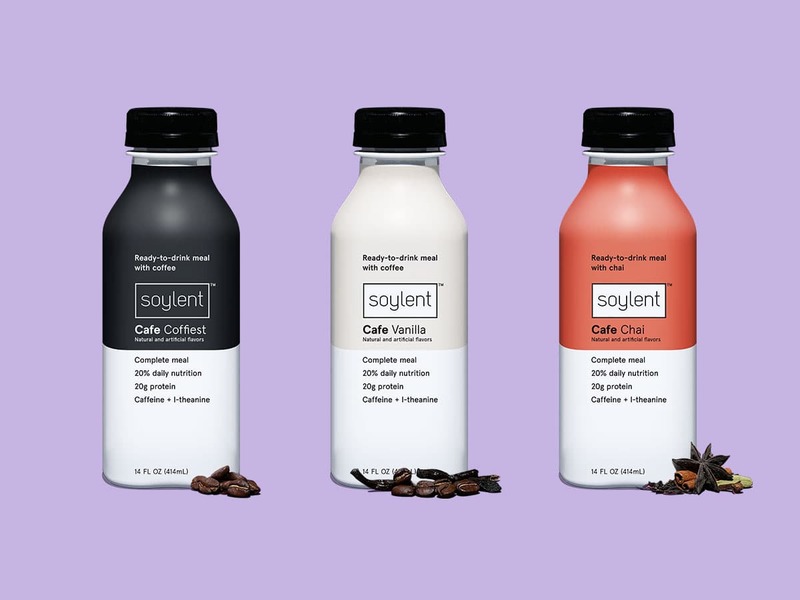 Soylent is mentioned in pop culture, but is also a real existing product. ^ I could use the minimal color schemes and typefaces. What seemed most relevant was how ‘packets’ looked like they were packed for individual use, or single use, which isn’t very sustainable but looks very futuristic. Will sustainability be a concern, or even considered in this pod-world? ^I liked this design the most. The transparent and translucent package and sheets that need to be peeled away create a very clinical, pre-planned feel. The circular boxes look a lot like petri dishes, as if the person eating this lives in—or belongs in—a laboratory. Is it necessary? No. The taste? Reviewers say it’s like any other drink. Does it look fun/cool to use? Depends on the person, but that’s the biggest appeal, not the actual drink. Did these taste as good as they looked? Definitely not. The weird carrot colored drink was awful and the brownies in the last picture were burnt. Did I tell people that? No. Why ruin the mirage? ^ Lacie bites very particularly into the cookie to literally compose her ‘candid’ photograph’—she proceeds to spit the cookie out as she doesn’t really want to eat it. ^ I knew that I could use the same design, of soluble individually packed products as part of the food packaging. During my process I again thought about Buzzfeed Tasty and realised simply creating the little packets wasn’t enough to design the food. These tray-like designs gave the feeling of faux-luxuriance which I wanted to capture. Another reason behind designing food trays is that they can also be linked to food that is delivered in asylum’s or prisons, basically areas of containment. ^experimenting with placement of ‘cutlery’ and food. Not, how did social media lead to this. But, stating (perhaps poetically) how this is a commentary on screens and social media. Introductory poster, added ‘trailer’, ‘commercial’ at the beginning of PSA. ‘Before we were limited by…apps, various social media. Now it’s all one synchronised app, in one place. You live it.’ etc. etc. Visual of the room? No visual? Historical documentary-like showing of iphones and apps? The Matrix and Soylent Green are fictional stories about dystopic worlds. ‘Soylent’ is a company that already exists, pitching itself as a convenient and completely nutritional balanced meal replacement. I’ve chosen to focus on the aspect of food for Project 3. The Matrix creates an illusion of food, where the scent and taste of the food is fed into peoples’ minds by the system, this is also evident in Bladerunner 2049. I want to explore the facade-like nature of social media. Ultimately, everyone in this world is living a simulated, fake, or orchestrated reality, similar to the way social media functions. By doing this I also want to emphasise the emphais put on appearance, for example, composing your food for the world to look at. This topic was also touched on by the Black Mirror episode Nosedive [need source]. ^research for different ways in which the function of food (nutrition? joy?) could be stripped down to the most crude form in this world. ^ Considering that nobody in the pod physically interacts with anyone, I want to explore the concept of touch. It’s relevant since even in the present social media and technologies attempt to enhance or replace things that don’t need replacement, for example, how to have a relationship. ^This is an experiment I did of a potential visual direction, of ‘touch’ through a screen. This outcome is likely to become a more poetic and abstract outcome, compared to the other projects. I sampled colours and looked at visual identity samples of projects that looked futuristic. A common thread was a dark base colour and blues, greens and purples. Here I considered whether to give people the option of choosing to do a task or not. Eventually, instead of eliminating the options completely, if users opted out, they would suffer penalties. I later looked at what those penalties would be. ^ This was the screen for people that would have retired and no longer need to study or work. The layout is built on the idea that there is constant distraction and fractured attention [need source], when using screens. I wasn’t satisfied with the way the layout appeared. I shifted my focus on people in the education stage. This decision was channeled by the fact that it would have the most functions necessary to get my concept across. People in the employee stage might have more menu items for their jobs, but explaining the job menu isn’t necessary for showing how a pod-person is interacting with screen on a usual basis. Whereas, babies and retired people would have less functions available to them. I considered this penalty, but it didn’t seem too impactful. I considered linking this to a future project, where I design the way these people eat food. The penalty would be related to the number or type of food items they receive. The idea is that the sceen is in control of even basic things, and everything is reduced to points, this concept was the basis of the Black Mirror episode I watched as precedent. Not satisfied with my initial sketch of the way the rotary menu and then subcategory appeared (popping out and then sliding up from the bottom of the screen), I did further research on interface design for large screens, especially those done by companies that are ahead in the industry, like LG and Samsung. I looked particularly into how they designed their smartTVs. The main concern was the use of Black Mirror. My intention to parody the way we watch these episodes in the present wasn’t clear, so I needed a different approach. Considering the age groups and how I wanted the entertainment of the people regulated, it felt suitable to have something very basic level for this age group. I chose Tom and Jerry as it doesn’t even require dialogue. The idea was that entertainment has been reduced to brainless slapstick or visual humor, like many vines and memes [need sources] of today. The other issue was that as someone viewing this for the first time, especially if they haven’t looked closely at other projects, my entire idea isn’t clear from just the visuals. I didn’t want to have subtitles as it would distract from the main visuals. A voiceover made a lot of sense, and linked to my previous interest in creating a PSA (when I wanted to make a PSA for why total surveillance is good for the people). In this kind of world, it makes sense to have propaganda like ‘infomercials’ to tell the people how good their life is. I was probably led to this conclusion through my readings on 1984, Brave New World, and other similar precedents. We live in a world brimming with opportunity. No one leaves their assigned quarters, nobody has to. The screens in each room provide a more than sufficient window to the world. Here’s a view of the screen in Hana’s room. She’s watching quality content that’s most beneficial and stimulating for the ages of 6 to 18, her occupation group. She’s just received a reminder to start studying today’s lesson. Like everyone else, she took an aptitude test at the age of 6. Since she’s best suited for a medical career, all her lessons are automatically selected and geared towards that. Though the screen allows us to meet and bond with family and friends, any interruptions to lessons are logically met with penalties. This could mean diluted flavours in the next food capsule, or a reduction in the number of capsules delivered to your room. Of course, Hana has ultimate control. By accepting a penalty, she can accept an incoming call, or resume the channel. Whatever she wants to prioritise she can. Now we can work, travel, and create families all through the screen. At the end of the day, it’s about freedom and happiness. Live life through the screen, witness astounding vistas, and never get bored. This combined with research on Harlow’s monkeys started me off for Projects 1 and 2. The idea of having rooms with screens all the way around and a life pre-occupied by screens is explored in this episode of Black Mirror. I brought to this concept the idea of not ever contacting another human being, by connecting this episode to Harlow’s monkeys. Finding this app was another driving factor behind Project 1 and 2. How far will we rely on technology to interact with each other, and when is it too much? ^The Sims was a source of inspiration when connecting it with the concept of Harlow’s monkeys and creating Projects 1 and 2. Are simulations and avatars of families enough to live a ‘fulfilling’ life, especially when there is no physical contact? ^ Positively showing interactions with a screen. ^ An example of how we over-rely on technology to teach us how to live life. Here the screen is instructing the individual on how to navigate relationships. This is similar to existing apps like Happn and Tindr. I incorporated the assertive nature of the ‘screen’ in Project 2. ^architectural references that I considered when planning Project 1. How people have utilized small spaces for efficient living. ^ A story by Ray Bradbury about how a futuristic nursery affects the psychology of children. The nursery is a room full of screens and scents, basically a technology that simulates a place, for example the beach or the desert. I was inspired by this when deciding how the screens woul be situated around the room for Projects 1 and 2. ^Various literature and adaptations (movie of Brave new world) I researched for building the concept of my world for Project 1 and 2. The ideas of Big Brother, Newspeak (changing language to change ideologies and control behaviours) becomes relevant in a world where an assertive screen is what people use to live their lives through. ^ I watched this and got inspired to do a PSA-like, unsettling, motion piece for Project 2. ^ I directly looked at these SmartTv interfaces to inform my design decisions for the screen in Project 2. Some movements (like how the menus appear) were more ‘futuristic’ then others. ^ A concept video by LG that has a section (the child attending school from his bed) that looks very much like what I had imagined for the room (how walls are made up of screens). I will probably use this to inform how I design the 3D model of the room. ^ Articles I read when sketching the design of the rooms, and how the world would function. I considered aspects like life expectancy, flow of currency, job automation, and death/burials. I also looked into the psychological effects of solitary confinement and the concept of family. Reading these helped me create the most plausible extreme of living in a room without human contact. LINK: Project 1, 2, 3D printing, LG concept video, Harlow’s monkey. ^ Reading into this helped spark my initial idea. ^ An article written about the future of living with constant surveillance and how we will choose to navigate our lives through that. Will there be a system, where one organization monitors/polices everyone, or will we create a system where everyone monitors everyone? These are concepts I thought about when working on Project 1. It made most sense to have a combination of both. Looking into this gave me insight on how I could use it to build a dystopic world. In my world, a mother figure or ‘human interaction’ would be present, but only in the form of screens. The questions this study opened made me consider whether I wanted to explore the concept of human touch in my projects as well. ^These two sources talk about the future of food, and how climate change and overpopulation will affect what we eat and create a need for technological intervention. LINK: Project 2, Soylent, Space food, The Matrix. Slot machines and online games are sometimes cited as examples of human devices that use sophisticated operant schedules of reinforcement to reward repetitive actions. Gamification, the technique of using game design elements in non-game contexts, has also been described as using operant conditioning and other behaviorist techniques to encourage desired user behaviors.